Looking for drills for [tag]offense for basketball[/tag]? You’ve come to the right place! Try out these [tag]basketball[/tag] [tag]pivot drills[/tag] that Doug sent to me. 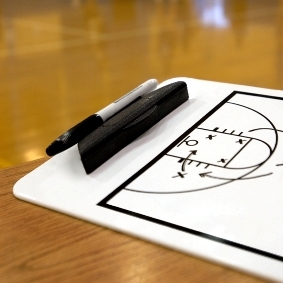 These will pay huge dividends with your team. Dizzy Pivot-Each player has a ball. Players do this as a warm up [tag]drill[/tag]. Players start using right foot as pivot foot. Players rotate at least 180 degrees (half circle at least) keeping pivot foot down and they keep going around until each player has completed this for 30 seconds. Line up with two lines (similar to doing warm up layups). 1st player in the line is [tag]defense[/tag], 2nd player is [tag]offense[/tag]. Defensive player gets right up on offensive player. Offensive player has the ball and fakes one way and then pivots and drives the other way to the basket. The keys here are selling the fake, sweeping or moving the ball (so as not to “show” it to the defensive player, and quick hard move to the basket. Have players switch to opposite line and make sure all players get to play offense and defense. Line up two players free throw lane width apart. One defensive player attacks the person with the ball, who pivots and moves left and right to open a passing lane to pass to their teammate. The defensive player quickly runs to the person with the ball and attacks until that person pivots and passes the ball. You can add two defensive players to simulate a trap (if you do this, spread the two [tag]offensive players[/tag] farther apart and allow them to dribble as well as pass off the pivot). The keys here are quick pivots, not “showing” the ball and hard passes. Offensive players should look to cut through the trap with a strong pivot move.